The Rebel Sweetheart. : Join | Green and Loving It! After the success of our previous partnership, Human Nature Laguna teams up once again with The Rebel Sweetheart to bring you Green and Loving It! 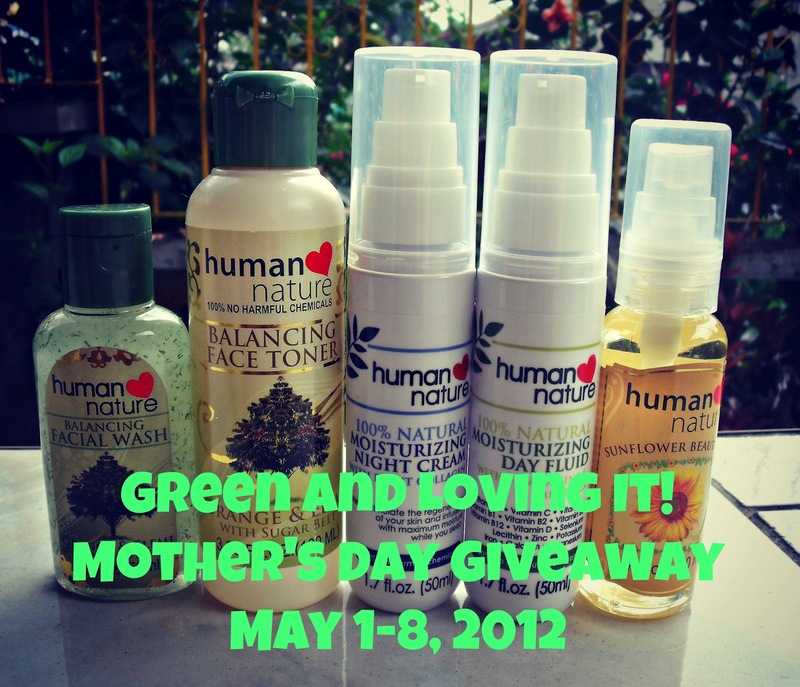 - a special Mother's Day giveaway. Enter this giveaway via the Rafflecopter form below. Please be patient as the form takes a few seconds to load. After you've entered my giveaway, please take time to visit all the other participating blogs listed below.This giveaway is part of the Green Your Mom Giveaway Hop, hosted by Happy Mothering, Eco-Crazy Mom and Simple City Life. I'd like to try the Citronella Bug Spray and 100% Bug Natural Shield to keep those pests away from my son. i love to try the sunflower oil coz i have been reading some raves about its whitening properties! I would like to try their Natural Hair Mask! I would like to try the natural Intensive hair mask! i've been hearing and reading good reviews about sunflower oil and i would love to try this. would love to try Natural Mineral Lip Gloss. and any other product as I have not tried it yet. Im excited to try the Sunflower Beauty Oil. been hearing alot about this product. the night cream would be nice as my lines are getting visible. i so love this. I would love to try the Natural Intensive hair mask! I would like to try the Natural Intensive Hair Mask because I have very dry hair. I very much interested to try out Human Nature's 100% Moisturizing Night cream with Plant Collagen because it claims that it can help combat skin ageing and erase all signs of fatigue and tired eyes, love it! I am curious about the Day Fluid and the Night Cream. I would love to try 100% Natural Healthy Lotion. I would like to try the sunflower oil. The Sunflower Beauty Oil sounds lovely! I love facial oils! id love to try the sunflower beauty oil! I'd love to try the Original Strengthening Shampoo and Body Wash with Pearl Powder and Aloe Vera. I want to know the beauty efficacy of pearl powder or if it's a myth. Nice giveaway. Thanks. I'd like to try the Luxury Body Scrub and the Strengthening Conditioner - Gugo Bark & Calamansi.